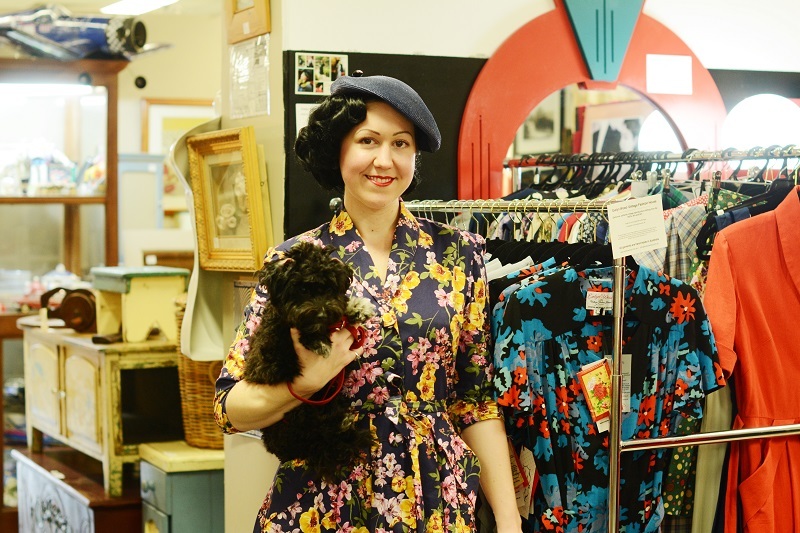 This week I had the pleasure of finally meeting the wonderfully talented Evelyn Wood, the designer of Evelyn Wood Vintage Fashion House and her adorable little dog Esme! 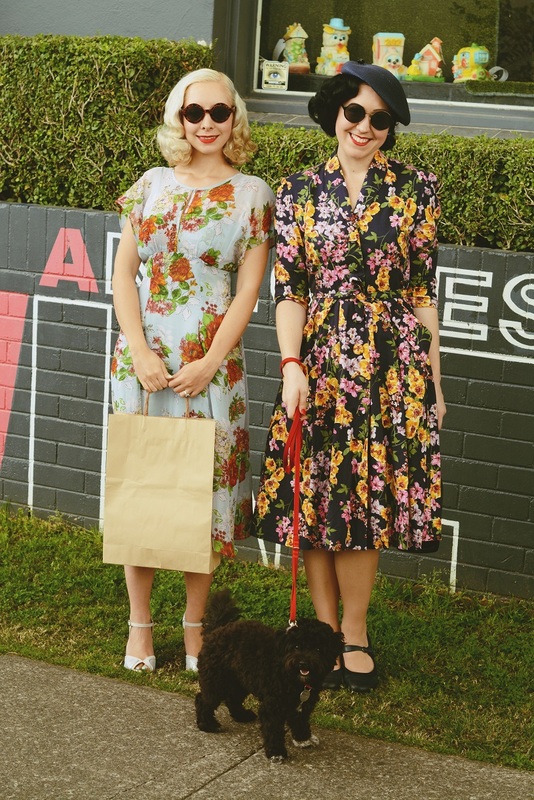 Evelyn Wood is a Brisbane vintage reproduction designer and her current collection features a beautiful selection of dresses, coats and capes that range from the 1930s to the 1950s, all of which are made locally right here in Brisbane by professional seamstresses. The quality of the workmanship of these pieces is absolutely superb and is so far the closest I have seen a vintage reproduction brand come in style and quality to authentic vintage pieces. 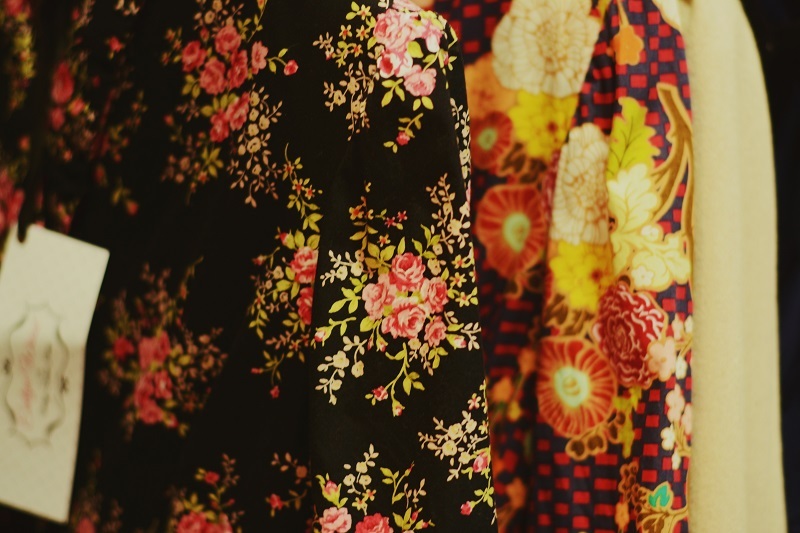 This is because all of Evelyn Wood's designs are based on vintage patterns with every garment put together using dress making techniques of the past, giving the clothes a true vintage feel without the anxiety that comes with wearing a vintage piece. Although spring is here, as a result of missing most of winter I have not had the opportunity to get many plaid outfits in and couldn't resist wearing some plaid one last time before it gets too hot. The Mildred dress is possibly the most perfect 1930s dress I have had the pleasure of wearing - I mean look at those bows and the incredibly figure flattering cut! I am a little jealous of those of you for whom autumn has just started as it is the perfect time of year to start wearing dresses such as this one! The Mildred dress will soon be available to order from Evelyn Wood Vintage Fashion House and comes in two lovely colours - and if you are in Brisbane you can pick up one for yourself at the Wooloongabba Antiques Center where Evelyn Wood currently has a pop up shop full of her stunning designs and will be there until next Monday. For those of you who live outside of Australia you'll be pleased to know that Evelyn Wood most certainly does ship overseas, and, has a great selection of luxurious velvet winter dresses and capes in store right now that will keep you warm and glamorous. Ooohh!! I have to check out her store, So beautiful garments! Oh how beautiful you look in this print!!! I am so glad I got to see this new one on you, the colors are perfect for you! It was such a pleasure to finally meet you also! I just love the picture with the 2 of us and Esme, she is captured perfectly I think! 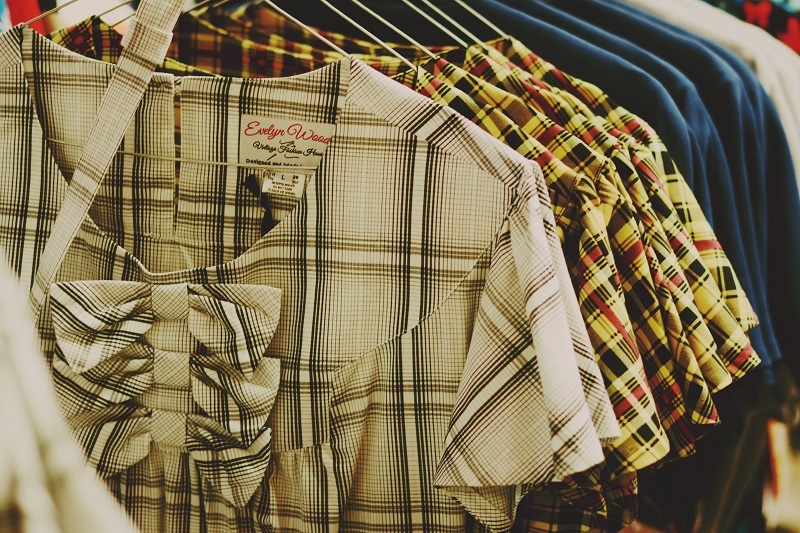 Oh that is the most lovely plaid dress! What lovely garments she has, I will definitely be checking out her site. Let's swap seasons! You don't want mine though - it's rained solidly for the last 5 hours here today... Anyway, you look lovely in this dress. The 30s really does suit you! I'm sad I don't get to take more inspiration from you for cold weather! Lindas, amei o look de ambas. OMG, that plaid dress is killer gorgeous!! Really in love with their Lucille Red Velvet dress!!! Va va voom!! Such inspiration for autumn, I'm starting to enjoy the season now. Thank you for introducing me to this brand, I do find a lot of reproduction to be bad quality, as a seamstress myself it can be difficult to spend on something pretty that won't last longer than few washes. Gorgeous dress, it really suits you. This plaid print looks so incredibly stunning on you! It goes superbly well with your hair colour. Evelyn's designs are so gorgeous, I could just stare at those dresses all day! How fun that you got to meet Evelyn Wood! I have been an admirer of her work since seeing one of her coats on the Nora Finds blog! Such wonderful pieces! 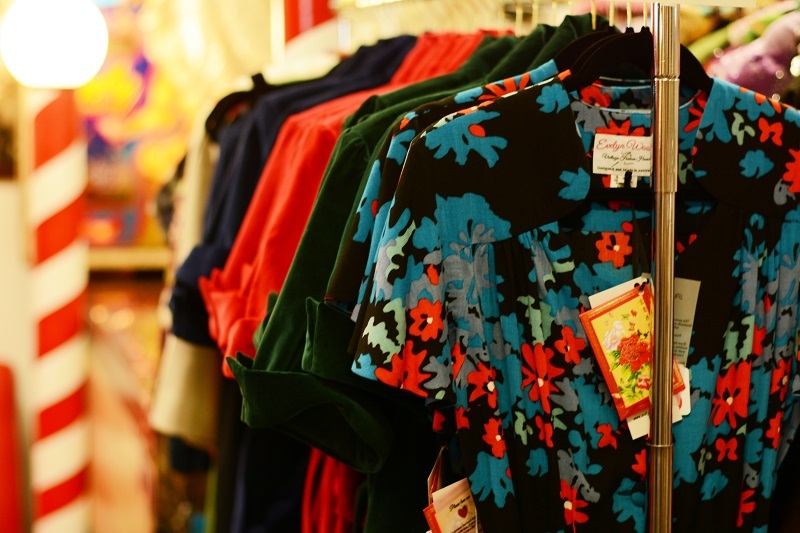 Have you heard of Revamp vintage? They seem to be pretty historically accurate as far as vintage reproduction goes too though I have never had the pleasure of seeing either of these company's work in person so I don't know how they would compare. Love your Evelyn Wood dress by the way! So pretty! Evelyn's work is jaw-droppingly fantastic! I've been following her on Instagram for quite a while now and can't get enough of seeing her fabulous, skillfully made creations. What a special treat the the three of you were able to hang out together. I'm afraid I got rather behind in my blog reading, but that just means I had the pleasure of looking at a bunch of your posts at once! I really adore the earlier styles on you, like that plaid dress. I'm gonna have to go check out those velvet dresses... I can't resist beautiful, weighty fabrics for fall and winter!